UPDATE: Obviously a lot more has come out since I first wrote this and my opinion of Full Tilt Poker has changed drastically. 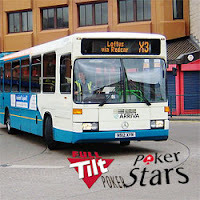 I really hate this phrase but some people have been throwing PokerStars and Full Tilt Poker under the bus since the indictments came out. The crimes they are alleged to have committed are quite disturbing but they have not been convicted of anything. Some people who were comfortable playing on those sites (probably mostly people that don't regularly play poker) in the past few years are now slamming them and trying to distance themselves from those sites. When other sites pulled out of the market FTP and Stars remained after consulting with their legal staff. Without them in the market there would be very little in the way of online poker for us Americans. Here's a summary of what happened and why I'm not ready to slam these guys. There was a push back in 2006 to make online gambling illegal. None of the proposed stand-alone legislation that would have made online gambling illegal became law. It wasn't until the UIGEA was added at the last minute to the SAFE Port Act[pdf] of 2006 that there was federal legislation that threatened online gambling. The other measures weren't gaining much traction in Congress but the SAFE Port Act had bipartisan support and was important legislation that needed to go through. It was the perfect act to sneak UIGEA into. The UIGEA prohibits the "acceptance of any financial instrument for unlawful Internet gambling". Aaron Todd summarized the UIGEA best as "The law was designed to prevent U.S. citizens from playing poker and casino games or making sports bets on the Internet by requiring banks and financial institutions to block player deposits to Internet gambling businesses." Since these gaming sites are outside of the jurisdiction of the US the most effective way to prevent online gambling in the US was to threaten US based financial institutions. Recently it seems that the banks have not only been pressured to not allow deposits but also to not accept withdrawals as some players on 2+2 have reported having their accounts closed after receiving cash outs. Fortunately they haven't lost their funds but it is a pain to have to set up a new account, especially if you have payments automatically scheduled. The general consensus is that online poker is not illegal except in some states that have specific legislation to that effect. There are a lot of issues with the UIGEA. One is that it possibly violates WTO polices. Antigua and Barbuda had won a verdict in 2007 against the US with regards to UIGEA and they continue to fight. If Online Poker Isn't Illegal Why Can't We Play? For most people they can't continue to play poker if they can't make the occasional deposit, which is now illegal. If sites like FTP and PokerStars want players in the US to continue to play the needed to find a way to have them deposit.After the UIGEA there were no legal options to do so. Chuck Kidd, CEO of PPNPoker who also runs a payment processor, indicated he could do it legally when he was on the QuadJacks Live broadcast but that does not appear to be the case based on the various documents I've read. The allegations in the indictment seem pretty bad in regards to setting up dummy sites to mask transactions as golf ball sales and other items instead of marking them as gaming transactions but keep in mind we've only heard one side of the story. PokerStars and FTP have not made any statements related to their defense of the charges. Even in the DoJ's indictment they stated that PokerStars wanted to operate in a more transparent manner. PokerStars' statements in the past revealed that they did not believe that what they were doing was illegal. This is a plausible argument since online poker is a game of skill and may not be lumped into the "illegal internet gambling" bucket in some jurisdictions, which would exempt it from the UIGEA. It is claimed that their "transparent" plan involved "bribing" banks to accept their payments. Another way to look at it is that they tried to convince banks that what they were doing was not illegal and they provided incentives to the banks to offset legal costs since the banks seemed to be under pressure because of the UIGEA. This is just a different way the charges could be interpreted. I have no idea what really happened. If the charges in the indictment are true there are obviously better ways that these sites could have acted. For example they could have restricted deposits but allowed US players to continue to play if they had money in their accounts. The countries where they are licensed and regulated could have also sought relief from the WTO as Antigua and Barbuda did or use other legal channels. During the legal battle American's would likely have not been able to make deposits. People make mistakes. If they made a mistake to get around a rushed piece of legislation that was snuck in another law, that possibly violates WTO regulations, restricts our personal liberties and ultimately didn't deprive people of any money, I'm not going to crucify them for it. The people that wanted to put money on the sites put money on the sites, the banks that processed the transactions did not have any funds stolen from them. They had financial incentive to (allegedly) do what they did. There's no doubt about it, but if they didn't do what they did we would have lost the ability to play online poker. The sites have done a lot for us and to promote and popularize the game. They took a risk. A risk that we also benefited from. I think it's wrong to bash them now. I trust that they will process our withdrawals and if FTP or PokerStars ever return to the US market I will gladly play on those sites. 3 Response to "Let's Not Turn Our Backs on PokerStars and Full Tilt Poker"
I'll say it again, best support staff i have ever seen. They are upfront about every question, they handle cheaters quickly and remove them correctly. I have no problems with these sites I still support them 100%. The government is wrong, not the poker sites. When i need to go to Russia to have freedom, there is a growing problem with our country. Just deposited onto MyPlayers.com. I'm going to try some of the DoN's on here. First thing you notice is the drop of in players in the room. Only 9k in peak times, and 4k off times. So you might wait some time to get a SNG started. Don't care for their lobby much so it will be a process getting use to this. It is clear. Without the big three you just can't make profits on sit n gos at these other sites. Stars has between 150 to 200k players all the time. Constant games and constant multitabling, but now the best your going to get is 10k and not all playing sit and gos. This destroys your hourly rate, plus when they legalize it they will issue only playing within states. It will be even worse. I think i'm about done here, unless i move to Canada at some point. Will US Poker Players Get Their Money? Carbon Poker for US Players? Watching the big name poker pros on TV tossing in a raise that could buy you a new car is awe inspiring. Poker, for the majority of us that play however, is quite different. The biggest pot we drag might only be enough to buy lunch or maybe just a large cup of coffee. But everyone has to start somewhere and many of the top online pros have turned as little as $50 into a fortune. I hope to one day be one of them and this blog will track my progress as well as poker related thoughts. So far I'm off to a pretty good start. At the time I created this blog my current bank roll is over 10x what I started with. This was from a combination of multi-table tournaments, sit-n-go's and cash games. My plan is to split my current bankroll up into a few small bankrolls that I'll use for specific games to (hopefully) illustrate how a small investment, along with time invested in learning can turn into a nice reward.